I’m terrified of a “mental contagion of ideas”. 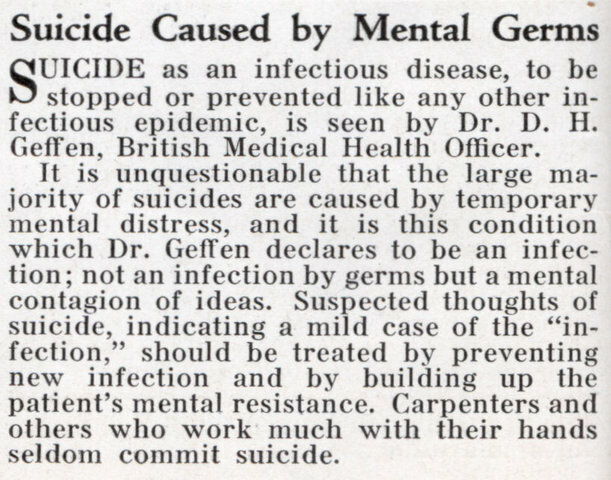 SUICIDE as an infectious disease, to be stopped or prevented like any other infectious epidemic, is seen by Dr. D. H. Geffen, British Medical Health Officer. It is unquestionable that the large majority of suicides are caused by temporary mental distress, and it is this condition which Dr. GefTen declares to be an infection; not an infection by germs but a mental contagion of ideas. Suspected thoughts of suicide, indicating a mild case of the “infection, ” should be treated by preventing new infection and by building up the patient’s mental resistance. Carpenters and others who work much with their hands seldom commit suicide. Didn’t Mojo Nixon ask for his head once? What? Lies, it is no disease! The last thing these people want to think is that they have a disease! This is such a dumb speculation. Almost as dumb as getting wound up over a theory from 1932 that never caught on. Temporary mental distress? Let me put it another way- TEMPORARY mental distress. so this stuff with god and all the real suffering , when one feels like and sees and finds no way out ,is it all temporary? and there is such as hell and heaven in earth, i do believe in god and it is in the bible that there is such thing as heaven in earth.And temporary means lasting for a time only, then hell is eternal as well as for the heavens,but this salvation, then what is it if no one is perfect but only god is, then living his rath is no game also to once life goal which is just the fact of the truth being reviled to one whom then really sees the light but yet temporary suffering comes along as you can see this is no game but i know god has an answer for every once question and its god who answers not us but only the grate god him self .and meany dont wish to play this game because with god and all that stuff is not some thing to play with do i sort of make my self clear i hope you do understand.